Hello folks! It’s been a while? What? Ten days? I needed that break from the internet world. I’ve been busy concentrating on my real life, and family and Christmas and all sorts of other good things. And now I’m back, all refreshed and feeling like a go-getter. Which means I am back with a ton of fantastic ideas to share with you. 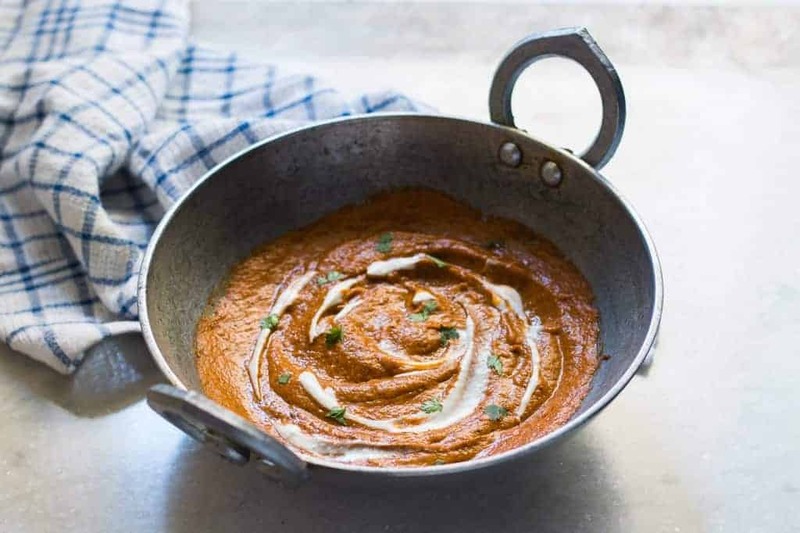 One of them and top of the list is this Indian Makhani Gravy or Curry. Which I’ve made by the jarful, so that I can eat some today and store some for tomorrow, or next week, or next month. Because it’s amazing and freezer friendly. On our way back from Mangalore, we stopped at our customary lunch haunt in Sakleshpur where we usually stuff ourselves with fried fish and chicken curry. But our cousin who was travelling back with us was a little under the weather, so we decided to stick to vegetarian fare. And we ended up ordering Paneer Butter Masala. Big mistake. Massive in fact. The hot tandoori rotis were the only saving grace. And the Chicken Fried Rice that Denver ordered. Which I ended up stealing most of. I realised then, how important a good gravy or curry base is. Especially with Indian food. And they are usually so easy to make. They just need the right ingredients and some proportions. We usually do andaaz but I realize how that doesn’t work for a food blog. Which is why I’m giving you a phenomenally easy recipe to make. If you are a busy bee and never have time to cook (like most of us), make a large quantity and just freeze them in small jars or freezer friendly zip locks. 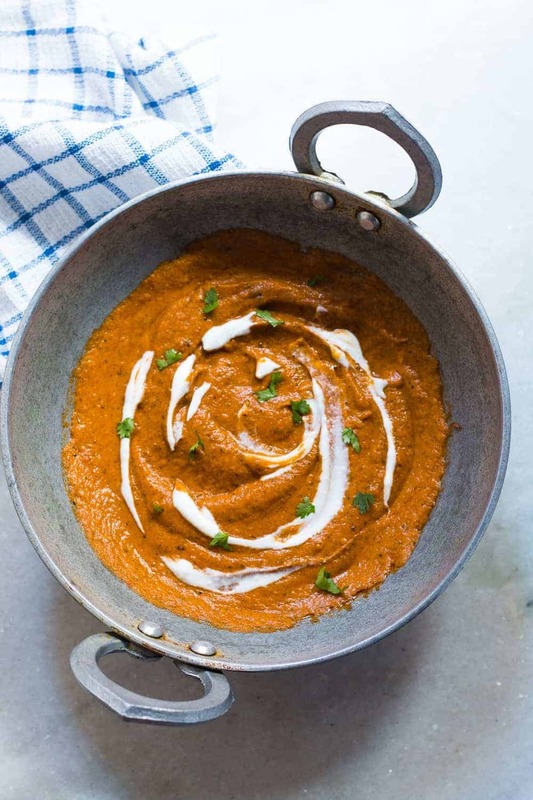 It’s perfect for all sorts of deliciousness: paneer makhani, murgh (chicken) makhani, paneer butter masala, chicken butter masala, veg makhani or even egg makhani if you are into that kind of thing. This basically works for everything except dal makhani. Most restaurants have gravies which are deep red in color. People, if you still haven’t figured it out, that’s just food colouring. Which we will steer clear of, except when we are making our Red Velvet Crinkle Cookies. That’s why this gravy is restaurant style, but orange instead of the crazy red that we are all used to seeing. I know you are tempted. Trust me you’ll never make makhani any other way! The below recipe makes gravy for 8 – 10 servings. I usually end up taking out one third of the gravy for immediate use, and freeze the rest in freezer friendly ziplocks. Make sure you use good quality ziplocks or freezer friendly containers to avoid spoilage or health hazards. You can easily halve or double the recipe. 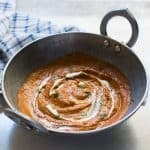 Learn how to make Indian Makhani Gravy or Curry, which is perfect for paneer or chicken makhani and paneer butter masala. Also can be freezed for later. In a large pan or kadhai, heat a tablespoon of butter and two tablespoons oil. Add green chili, red chillies, ginger, garlic paste and whole spices. Saute for a minute or two and add cashew nuts, poppy seeds and tomatoes. Mix well. Cover and cook this for ten to fifteen minutes till the tomatoes start breaking down. Switch off the flame and set aside to cool. 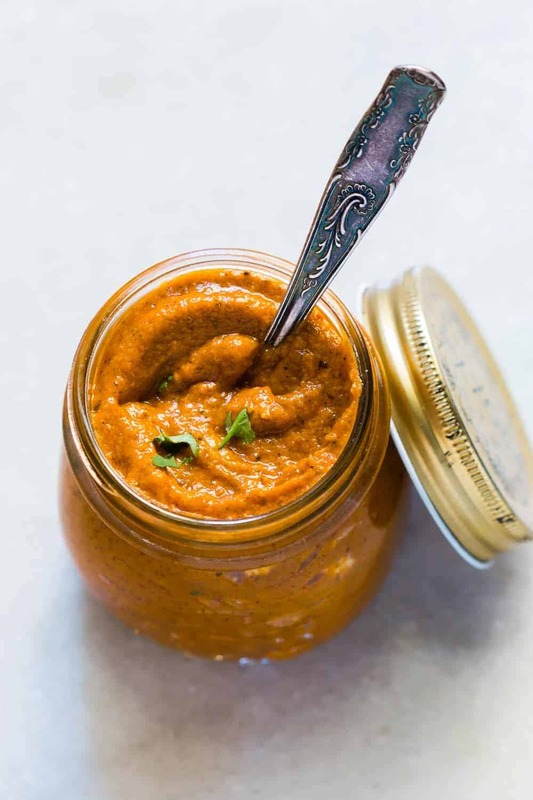 Once cool enough to handle, fish out as many whole spices as possible, and grind the mixture to a smooth paste. In the same pan or kadhai, heat the remaining butter and add the tomato paste. Add garam masala powder, chili powder, turmeric, ketchup, salt and sugar or jaggery (if using) along with 1/2 cup water. Bring this to a boil. Once the curry comes to a boil, simmer and cook for 30 minutes, till the oil separates slightly. In another pan, dry roast the kasuri methi and grind it to a fine powder. Mix kasuri methi and fresh cream in the curry and switch off the flame. Let the curry cool completely before dividing it into smaller portions and freezing it in ziplock packs. Say I want to add chicken thigh meat to this.. when would you say the best time to brown the meat and add it in would be? Hey Sarah, you can add a little oil, cook the makhani paste, add chicken and water and then let this simmer till the chicken is cooked. I was introduced to this amazing curry by my son in Woking, England last weekend. All cooked outside on a charcoal burner. It is beyond doubt the tastiest curry I have ever eaten. Period. Try it. Im making this now. To clarify, so I take the spices out and grind them into a paste? Or just the tomatoes and discard the spices? I must say your gravvy is delicious and easy to make. In the past few daz i ve made d gravvy quite a few times, and everybdy gives me a compliment. All thanks to you and your hard work. Pls share a few more different gravvies for we vegetarians. God bless you and your passion for cooking. I tried this one out twice now, it’s awesome. I’ve been carrying around the memory of the taste of a local Indian restaurant that closed down, they did a great makhani but they’re gone… I finally managed to replicate the taste with this recipe (I added just a bit more garlic second time round). We all know how important a good and tasty gravy base is. Especially in Punjabi sabji or in Indian food. The right amount of ingredients makes the gravy tasty and delicious. And if you’re good in making gravy than you’re a master chef. Hi! I’m so excited to try this recipe! Can you tell me the steps to finish the dish, using this paste? Thank you! Hey Mandy, you can use this paste as the base for any curry you’d like to make. Just use a 1/2 -1 cup depending on how much curry you want to make, add veggies or protein and simmer till everything’s cooked. You will need to add extra salt. You can also add some cream or coconut milk to make this creamy. I recently got an instant pot and would love to make a big batch of this using IP. still newbie at it and wanted to check if you would know what steps need to be modified. Thanks! I haven’t tried this in an IP Neha, but I would say that you can use the saute function for this curry. In Step #5, instead of boiling it, just cook it on high pressure for 8-10 minutes. You might need to simmer it a bit if its too watery, but the taste should be the same. When you “fish out the whole spices”, do you also include the whole fresh chillies in that and grind those up too? Making right now, thanks! Hey there! Yea we fish out only the spices so the chillies stay in. The dried red chillies give the gravy it’s colour and flavour. 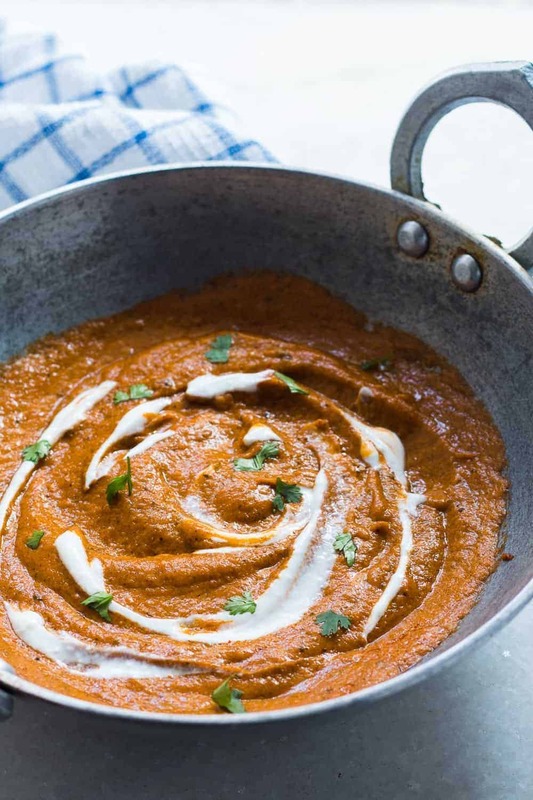 Your makhani gravy is not only easy to make, but most importantly: it is so delicious! Love it! Hey Greg, thank you! I’m so happy that you liked it. You can skip the cashews altogether, and add a little extra cream to the gravy, right towards the end. That should do it! Kasuri Methi seeds or leaves, dear? Being a foodie I am always on trials,I was searching excellent recipe for Makhani gravy,I must say your recipe turn out yummilicious. And I had tried Sanjeev kapoor’s makhani recipe but it was okay.so Thumbs up for your recipe ??? ?.